April 22-24 you can score yourself a FREE COPY of Don Elwell's novella "In the Shade", a modern day take on ghosts and vampires. . .sort of . . . really, you'll have to trust us on this one. Just go HERE and snag your free Kindle copy (caution, some adult materials). Okay, so we messed up. 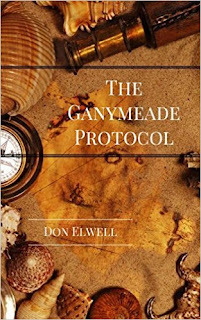 We noted an error in the revised edition of "The Ganymeade Protocol" that we only just released. Not serious, just a rather odd change in the font about 3/4 way through the book, but it bugged us. So there will be a three days where the book may not be available in soft cover (April 2-5) while we address the files. If you're interested in an electronic edition, our kindle Ebook has already been corrected. If you'd like your own Ebook copy, they can be had here. Want a hard copy? After April 5, you can just click here for a corrected version. Apologies for the inconvenience. This is one of our most downloaded books, and we wanted to make sure it was right. By the way, if you purchased the revised edition between January 21 and April 1, and would like a corrected copy, write us at exchange@wildshorepress.com and we'll be happy to trade copies with you, our dime.